The Loire Valley is often referred to as "the Garden of France" and the Cradle of the French Language. (The city of Tours is reputed to speak the purest French.) Listed (at least in part) amongst the UNESCO World Heritage Sites in late 2000, the Loire Valley is also noteworthy for the quality of its architectural heritage, in historic towns such as Amboise, Blois, Chinon, Orléans, Saumur and Tours, but in particular for its world-famous chateaux (castles), such as the Châteaux Amboise, Azay-le-Rideau, Chambord and Chenonceau. The rolling riverine landscape of the Loire Valley - and more particularly its many cultural monuments - is redolent of the ideals of the Renaissance and the Age of the Enlightenment on Western European thought and design. 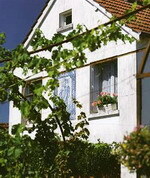 The valley is also known for its wineries, many of which offer tours. On 2 December 2000, UNESCO named the central part of the Loire River valley, between Maine and Sully-sur-Loire, to its prestigious list of World Heritage Sites. In choosing this area that includes the France Départements of Loiret, Loir-et-Cher, Indre-et-Loire and Maine-et-Loire, the committee said that the Loire Valley is: "an exceptional cultural landscape, of great beauty, comprised of historic cities and villages, great architectural monuments - the Châteaux - and lands that have been cultivated and shaped by centuries of interaction between local populations and their physical environment, in particular the Loire itself." Very comfortable two-bedroom gite on two floors with its own terrace and entrance from Chess Garden at La Couture. Communal pool, pets are not welcome, not suitable for wheelchairs, not suitable for the elderly. 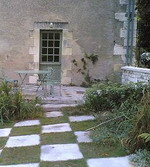 Very comfortable gite on two floors with its own terrace and entrance from Chess Garden. Two bedrooms (one with double bed, one with twin beds). Upstairs Sitting Room and downstairs farmhouse kitchen. Bathroom with WC, basin and cast-iron claw-foot bath. Additional chidrens beds are available on request. 4-course dinners in the main house are also available on request at €29 per person including wine. Beautiful gardens and walks, swimming pool. Sleeps 5. Professionally designed apartment with two double bedrooms, bathroom with bath, shower and separate wc, fully equipped kitchen, central heating, woodburner. Ideal for two couples travelling together and also makes a perfect romantic hideaway for one couple. Preuilly sur Claise is a picturesque village with boulangeries, mini-supermarket, bars and restaurants all within easy walking distance. In fact the nearest baker is an easy two minutes walk from the house. So, although a car is needed to take advantage of the countryside and to visit the Loire Valley chateaux, it is also possible to find everything needed for a peaceful holiday within walking distance. For the angler the nearest fishing is just five minutes away on the River Claise and there are many more fishing opportunities in the surrounding area. There is a network of "Sentiers de Randonee" (footpaths) nearby, the nearest of which can be reached without a car. You will need to drive to Preuilly Forest, but will be repaid by beautiful scenery and sightings of deer and other wildlife. 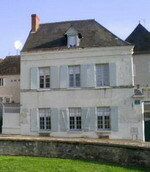 Loches, with its chateau and twice-weekly market, is twenty minutes Sleeps 4. The Garden Lodge is the original chauffeur’s house of a Edwardian villa situated in the village of Boiscommun in the beautiful Loiret district of France, east of Orleans, surrounded by rolling fields and the ancient royal forest. The Lodge is a detached house situated behind Villa Cedrus, the main building, in a large secluded walled garden and has a one bedroom flat fitted with everything necessary for a relaxing stay. It is close to Paris and Orleans and within the Loire Valley, at the heart of the Chateau Country and vineyards of the Loire. Situated in its own building behind Villa Cedrus, the accommodation is suitable for two people, and comprises a comfortable double bedroom. A fully furnished sitting room. Sleeps 2.